Fourteen years on from its first publication by Days of Wonder in 2004, Ticket to Ride has sold millions of copies, been the subject of multiple expansions and core sets, won the Spiel des Jahres, and remained a classic piece of Eurogame design. Fourteen years on and it is still one of the best gateway games into the hobby. Having previously gone around the world with Ticket to Ride: Rails & Sails, the very latest entry in the series is perhaps the smallest, certainly the most urban! Ticket to Ride: New York takes the series away from the Mauve Age setting of the previous games into the future of the 1960s. Instead of racing across the United States of America, Europe, the United Kingdom, and so on, it takes the players to the Big Apple for some big changes in a small game! 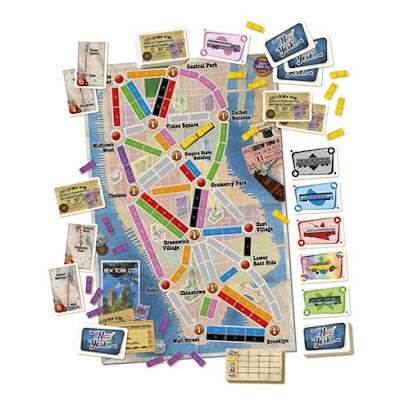 Designed for two to four players, aged eight and up, Ticket to Ride: New York sees the players racing up, down, and across Manhattan with a diversion across the East River to Brooklyn, not in trains as in every other Ticket to Ride game, but taxis! This is the first of many changes to the Ticket to Ride series. These changes primarily stem from the game being smaller—a smaller board with fewer destinations and fewer routes; each player having fewer trains (or rather fewer taxis); and there being no scoring track around the edge of the board. Instead of the latter, the game includes a scoring pad and a pencil. The game includes just forty-four Transportation cards in seven colours plus multi-coloured cards. As play progresses, the players will draw these and then use them to claim routes on the map. The other cards are the eighteen Destination Tickets each of which connect two of the Locations on the map. These range in value from three to eight points, which a player will add to his final score for each one he completes and subtracts from his score for each one he fails to complete. The map itself, from Lincoln Centre and Central Park in the north to Wall Street in the south, marked with just fifteen Locations, connected by a series of coloured routes, the colour of these routes matching the colour of the Transportation cards. Some locations are marked with a number ‘1’, such as Empire State Building and Chinatown. If a player connects to these in the course of connecting the Locations on his Destination Tickets, then he scores an extra point at the end of the game for each one. The player who has the most points at game’s end wins the game. 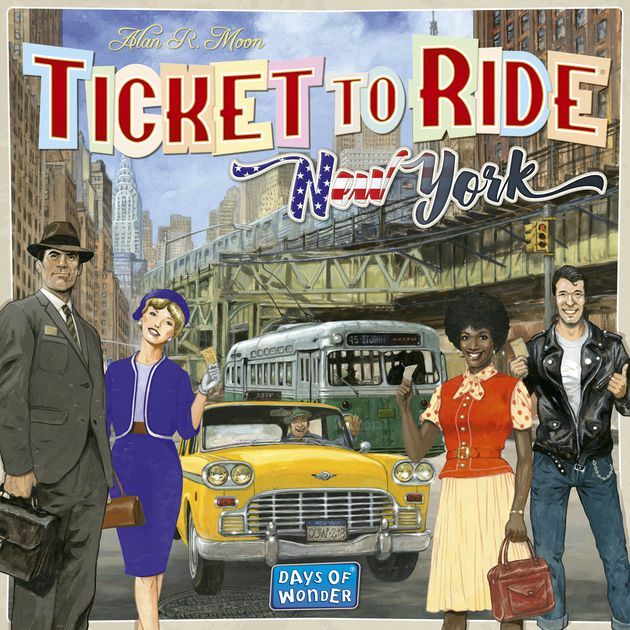 Play in Ticket to Ride: New York is the same as standard Ticket to Ride. Each player starts the game with some Destination Tickets and some Transportation cards. On his turn, he can take one of three actions. Either draw two Transportation cards; draw two Destination Tickets and either keep one or two, but must keep one; or claim a route between two connected Locations. To claim a route, a player must expend a number of cards equal to its length, either matching the colour of the route or a mix of matching colour cards and the multi-coloured cards, which essentially act as wild cards. Some routes are marked in grey and so can use any set of colours or multi-coloured cards. No route is longer than four spaces and a player will score points for each route claimed. All of which points to standard Ticket to Ride game play. What marks Ticket to Ride: New York as being different from that standard game play is most obviously its size, but once it reaches the table, what marks it out as being different is its speed of play. With fewer taxi pieces—fifteen as opposed to the forty-five in standard Ticket to Ride—a player has fewer resources and with fewer routes to claim, play is quick. The shortness of the routes means that a player will spend less time drawing Transportation cards, rather than having to draw again and again in order to have the right number of Transportation cards needed for long routes—routes five, six, and seven spaces in length are common in standard Ticket to Ride. Removing the scoring track from around the edge of the board also speeds game play as the scoring takes place at the end of the game rather than at the end of players’ turns. The playing time for Ticket to Ride: New York is listed as being between ten and fifteen minutes. For experienced gamers this is about right. Anyone new to the game or at the younger age of its suggested age range might increase that a little. Physically, Ticket to Ride: New York is very nicely produced. Everything is very bright and breezy. The taxi playing pieces are cute, the cards are very clear and easy to read, if perhaps a little small in the hand, and the rules leaflet short, but easy to understand. The re-theming to New York and the 1960s adds a certain charm. Ticket to Ride: New York might be seen as a taster version, an introduction to the Ticket to Ride family, but it does not feel like that. Plus, for a younger audience, it already has that in the form Ticket to Ride: First Journey. Rather, with its short playing time, reduced number of components, and smaller amount of space it takes up—not just in terms of the box it comes in, but also when out on the table, what it suggests is that Ticket to Ride: New York is the travel version of the game as much as anything else. Its short playing time also makes it the ‘filler’ version of Ticket to Ride too, a version of Ticket to Ride when you do not want to play Ticket to Ride. Overall, Ticket to Ride: New York does not offer anything new for fans of the Ticket to Ride series of games—really more of the same, but faster. As a travel version, its short playing time and its smaller size means that it fills a certain niche.